Sillhouettes III - aka "Look Behind You, Dummy!" Denny Jump (Bellevue, WA, United States) on 7 March 2012 in Landscape & Rural and Portfolio. True to the lessons we learn from the REAL masters (see my personal definition of a "real master" below) like Gary Hart, Don Smith, Scott Schiling, and others, I ALWAYS make it a habit of turning around, looking up, and looking alll around! I have often found if the sunrise or sunset I am looking directly into is really not all that "exciting" then, turn around and have a look in the opposite direction! Look up! You wil probably find an "entirely different story" if you do that. Especially AFTER the sun sinks below the horizon! This image shows such a view. I made no adjustments here in terms of saturation or colour. I DID leave my circular polarizer on the lens even though it was getting a bit darker and that may have had some impact on the tones here. But other than that, I only tweaked the highlight and levels by a small amount in order to bring it back to what it looked like on scene. PS - My personal definition of a "True Master" in Photography, or any other Art Form, is: One who is not only an expert in her or his craft, but one who also "has a heart" and is willing to share and teach in an unselfish, kind, and, perhaps most importantly, a non-condescending manner. Yes, you are absolutely right. The few times I have remembered to turn around I inevitably wonder why I don't always do it. We are surrounded by beauty. This kind of sky always makes a good backdrop. Fabulous. Always look around, up and down, surely behind you! Great share. An excellent post in image and text, Denny. I always do the same; scan the entire view for treats, surprises, challenges, and more. This is a beauty mood here with the dancing clouds and such a rich blue sky tone. I like your closing thoughts, too. you did well to 'turn around', denny ... this is a truly remarkable image, and the colours are breathtaking ... ! It's like seeing two pictures in one composition. 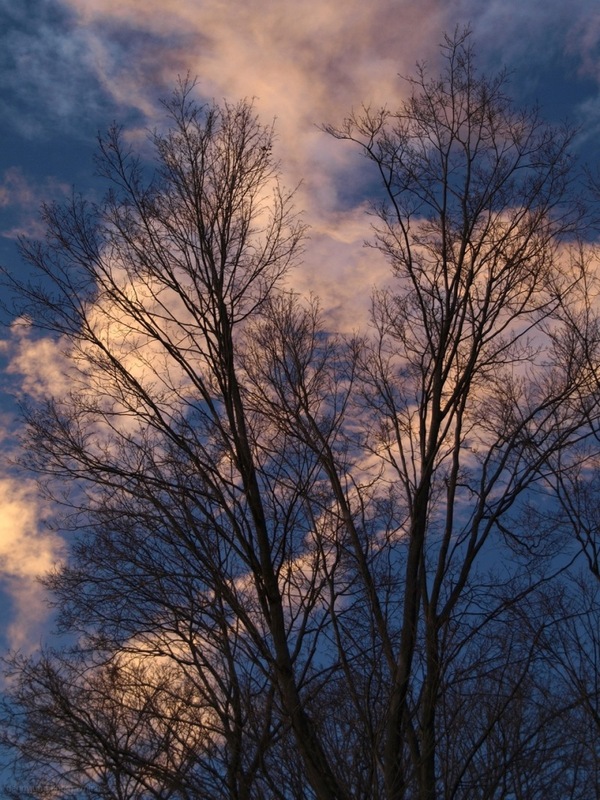 I love the silhouette of the trees against the backdrop of the animated sky with clouds. Great height that you've given this compo as well. The picture has this special light you get after the sun has disappeared,the kind of light I'm really found of ! Fantastic! Beautiful! The sky and clouds are beautiful!